Dave Luna was born in 1940 in Orange, California. He enlisted in the U.S. Air Force on January 25, 1961, and completed basic training at Lackland AFB, Texas, in March 1961. 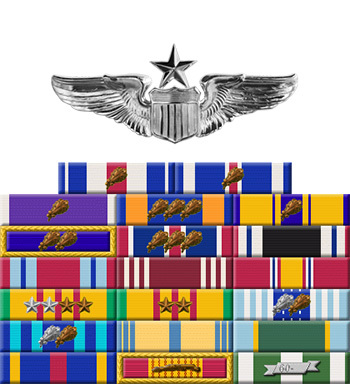 He was then accepted into the Aviation Cadet Program of the U.S. Air Force for Navigator training, and was commissioned a 2d Lt and awarded his navigator wings at Harlingen AFB, Texas, on March 20, 1962. Lt Luna next attended Electronic Warfare Officer (EWO) training at Mather AFB, California, from April 1962 to March 1963, followed by service as an EWO with B Flight of the 4677th Defense Evaluation Squadron at Hill AFB, Utah, from April 1963 to October 1966. Capt Luna served as an F-105F Wild Weasel EWO with the 354th Tactical Fighter Squadron of the 355th Tactical Fighter Wing at Takhli Royal Thai AFB, Thailand, from November 1966 until he was forced to eject over North Vietnam and was taken as a Prisoner of War on March 10, 1967. After spending 2,187 days in captivity, he was released during Operation Homecoming on March 4, 1973, and then was briefly hospitalized to recover from his injuries. After completing Undergraduate Pilot Training, Lt Col Luna served as Assistant Operations Officer, Chief of Current Operations, and as a Flight Examiner with the 1402nd Military Airlift Squadron at Andrews AFB, Maryland, from June 1975 to February 1981. His final assignment was as Chief of Airfield Management for the 1776th Air Base Wing at Andrews AFB from February 1981 until his retirement from the Air Force on October 16, 1989. 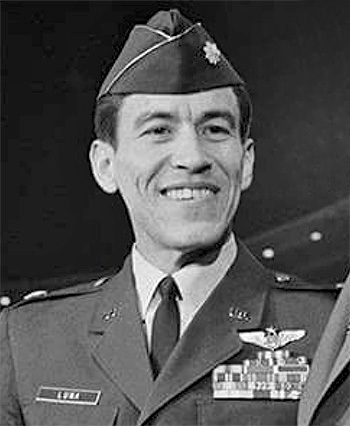 Captain Jose D. Luna distinguished himself by gallantry in connection with military operations against an opposing armed force as an F-105 Electronic Warfare Officer in Southeast Asia on 10 March 1967. On that date, Captain Luna provided vital information as to ensure the successful strike on a major steel mill complex. Then at great risk to his own safety, he attacked a surface-to-air missile site while flying through intense and deadly antiaircraft artillery fire. By his gallantry and devotion to duty, Captain Luna has reflected great credit upon himself and the United States Air Force.